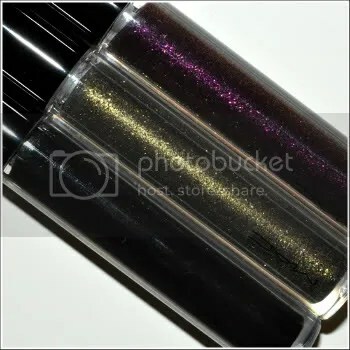 Color Club – Yum Gum vs. Modern Pink and MAC lip gloss ingredient lists! These are the two hot pinks I have from Color Club that are a plain creme. If you wanted this color and couldn’t decide which to get, get Yum Gum because it smells so heavenly!!!! Okay, so on to the MAC lip glosses! I LOVE their lip glosses. Especially the black line! It is the only formula that doesn’t dry my lips out, it stays on, its nice and smooth, doesn’t have any negatives for me whatsoever! Since I like to try and make my perfect colors out of frankens at times, I wanted to go on TKB Trading and get some mixes. (If you do this, get the rum or pecan flavor oils, holy crap they make it smell sooo good!) I wanted to find the MAC ingredient list so I could pick the same base, but I couldn’t find an updated ingredient list anywhere! I asked them on their site and it took them weeks to get back to me, but this morning I finally had the ingredient lists! This entry was posted in experiments!, general polish yumminess, swatches, YAY! and tagged color club, creme, dazzleglass, hot pink, lip gloss, lipglass, mac, modern pink, nail polish, pink, scented, summer, swatch, yum gum on June 28, 2011 by hollyshimmerspark.